Create a taste that is as refreshing as an icy glass of lemonade. 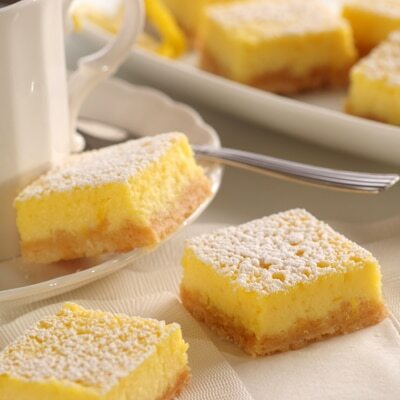 These mouth-watering lemon bars are a great summer treat, and perfect for entertaining or picnics. COMBINE flour and powdered sugar in medium bowl. Cut in butter with pastry blender or 2 knives until mixture is crumbly. Press lightly onto bottom and halfway up sides of ungreased 13 x 9-inch baking pan. BEAT sweetened condensed milk and eggs in large mixer bowl until fluffy. Beat in lemon juice, flour, baking powder, salt and food coloring just until blended. Fold in grated lemon peel; pour over crust. BAKE for 20 to 25 minutes or until filling is set and crust is golden brown. Cool in pan on wire rack. Refrigerate for 2 hours. Cut into bars; sprinkle with powdered sugar.